Who says the Halloween decorations have to be all about ghosts and witches? The kids? Well, parents can claim their corner of in fall decorating by doing more with pumpkins than sawing them into eviscerated, snaggle-toothed goblins, especially since pumpkins stay around for Thanksgiving as well. The color and shape of pumpkins convey the richness of the harvest season. More, they come in so many varieties, shapes and sizes, it’s easy to add interest to a centerpiece, counter or room adornment using pumpkins as a base and embellishing them with natural elements like flowers or branches. So save some of the season’s pumpkins for some of these fabulous fall decorating ideas. Before You Get out the Big Knife . . . Think about how long you want your decoration to last. Once cut, pumpkins last only a few days before succumbing starting to dehydrate and get moldy. Using commercially available “Pumpkin Fresh” or a diluted bleach solution can extend the pumpkin’s life to 10 -14 days. If your heart is set on the cut pumpkin décor, don’t cut until the day of the party. Craft supply stores have white, orange and black “craft pumpkins” that can be carved as well. While not as sumptuous, these Styrofoam alternatives fit into lots of decorating schemes. A simple way to showcase the pumpkin is to put it in the center of the table. While it won’t draw much attention plain, a few frills turn it into a stunner. The pumpkin’s smooth surface complements the more detailed lines of fall flowers like mums, dahlias or poms. But who says the flowers have to go IN the pumpkin. Place the pumpkin in the center of a floral fall wreath instead to enrich the table and impart the harvest feel. Flanked by tall candles in deep purples, the centerpiece helps make the ambiance both regal and relaxing. Another way to enhance a pumpkin without robbing it of its natural character is to find some small chrysanthemums and remove the stems. 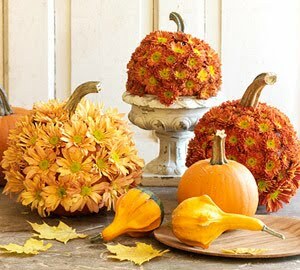 As seen in Better Homes and Gardens, use a glue gun to affix the flowers to the pumpkin, resulting in a lovely globe of rich fall colors. Because flowers provide so much complexity, there is no need to add anything elaborate around the base of this centerpiece. Simply place it on a wooden cutting board or pewter platter. Want to make sure guests can see each other over the center of table and pass the food easily? Mix softball sized pumpkins and the smallest gourds in a shallow metal or wooden tray. Fill the gaps with fall flowers and pine cones. Pillar candles at each end add some height to the display without blocking the view across the table. Decorators prize natural resources in the fall and encourage homeowners to add metallic gold and silver accents to their tables. Some take care of this by spray painting smooth and nubbly pumpkins and gourds, and placing a variety of these together on a clear glass plate as a collection. There are lots of ways to keep pumpkins intact while using them in your fall decorating plans. Complemented by a bouquet of fall flowers, held by a stemmed cake plate in white or pewter and kept company by smaller gourds, the intact pumpkin brings autumn indoors. The squat pumpkin makes a surprisingly sophisticated vase. With the top and contents removed, the pumpkin holds water for up to seven days. Decorators also put flower foam, dirt and even a plastic container inside to hold and nourish flowers. The trick is to get enough flowers to balance the heft of the gourd. Crowd roses, lilies, poms and more into the pumpkin’s opening. Colors coordinating with a typical orange pumpkin are off-white, yellow and green. Mix things up, too, by considering a white pumpkin this year, sometimes called a fairytale pumpkin. Flowers in yellows, peaches and shades of orange, accented with sprigs of hypercium berries complement the white pumpkin shell beautifully. If you use a cut pumpkin, consider coating the cut edges in Vaseline to extend freshness. Remember: craft stores carry white foam pumpkins. Festooned with natural flowers, guests will never know the pumpkin came from a factory rather than a farm. Pumpkins don’t need to be 20 pounders to qualify as vases either. The small grapefruit sized pumpkins and even the tiny gourds can hold dry grasses, votive candles and taller candles. They also add interest to the centerpiece by holding the flowers while the big pumpkin remains uncut between them. Consider, too mixing a bud vase with a candle and a small pumpkin on a pedestal. Combinations like these reflect the rich variety of textures available in autumn. Check out Martha Stewart’s version by clicking on the image. Next time you’re in the grocery store looking for the obligatory jack-o-lanterns for the kids, pause a moment to appreciate the beauty of the common pumpkin. Its buttery smooth surface and even lines could round out a Halloween or fall theme in your home. For $6 to $15, you’re buying an unusual, seasonally appropriate decoration. And you won’t even have to find a place to store it afterwards.